Welcome to the Little Girl’s Bedroom Makeover Series. 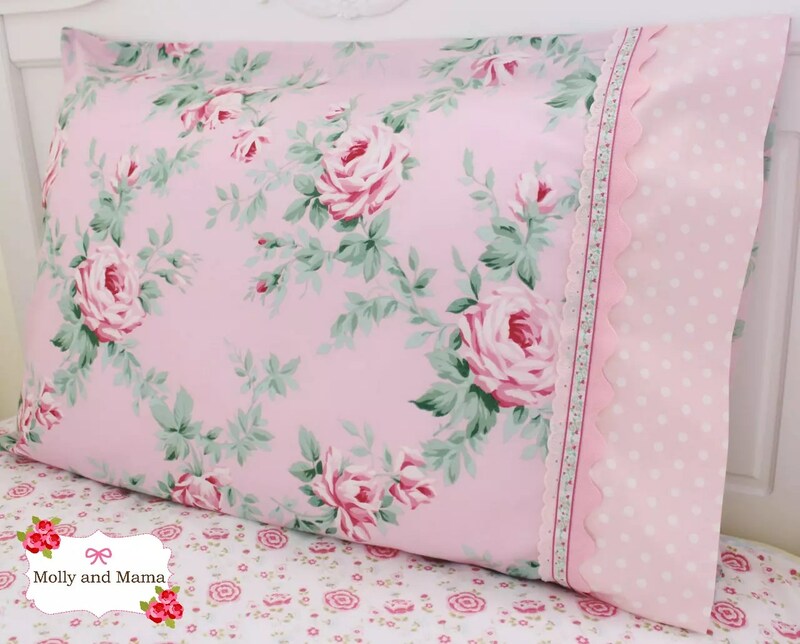 In this series we’ll be creating a whole range of pretty pieces for a girly bedroom, including pillowcases, pillow shams, cushion covers, embroidered hoop art, a hair clip holder and more. But today is all about the good ol’ pillowcase. I’m what you’d call a ‘girly girl’ and I absolutely LOVE florals and pink! Now I realise that this isn’t everyone’s cup of tea. So if you can get past all the prettiness, I promise you’ll find some tips and ideas you can use with your own favourite colour scheme or fabric. And one last thing before we begin; I’m sewing in Australia and it seems that the terminology can really differ from continent to continent. So I’ll try and make this as user friendly as I know how. But if you have any questions, please don’t hesitate to ask. So without further ado, let’s begin! Today’s tutorial is a bit of a warm up. Something simple and fun, and quick to whip up. Yes, I’m talking about the humble and ever-practical pillowcase. 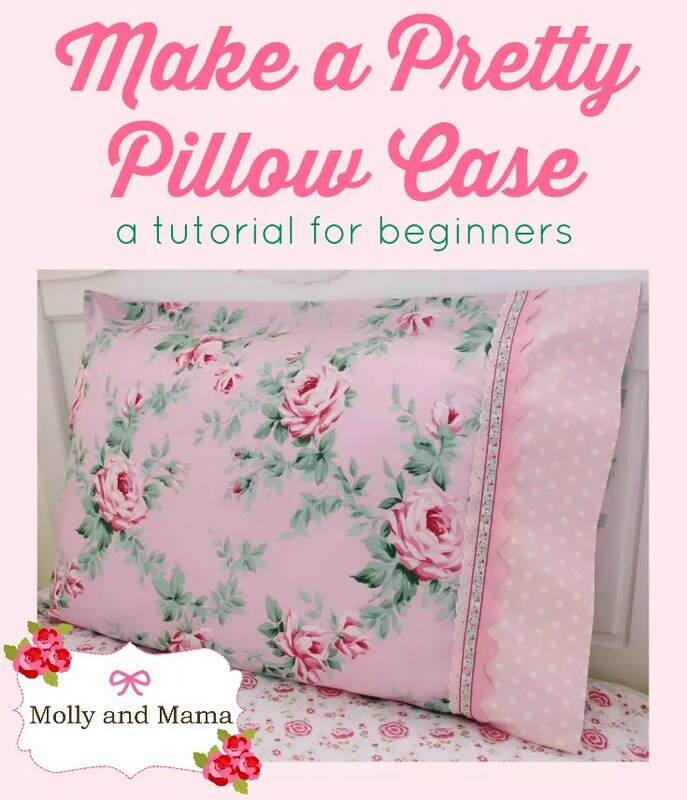 There are a lot of tutorials out there for making pillowcases. And everyone has a favourite method. But I like to keep things as simple as possible. 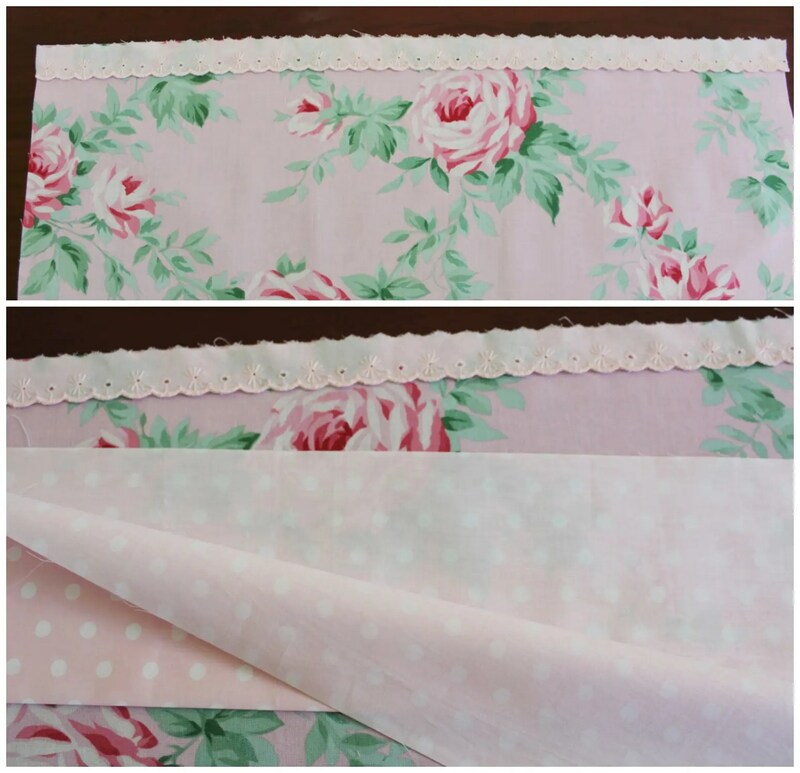 I like tutorials to be easy to follow and simple for those who are new to sewing. I like to use up fabrics, trims, and notions from my stash. If you’re anything like me, you’ll have a whole hoard of goodies to choose from! So for this project, I chose a pretty floral quilter’s cotton for my pillowcase fabric and a coordinating cuff from polka dots. Sheeting, poly cottons and poplins are probably more ideal fabrics for bedding (especially for faces to rest against). But I couldn’t resist the roses! I’m sure my daughter won’t mind. I also discovered some pretty lace, ric rac and braid that worked together well. You could use ribbon too. 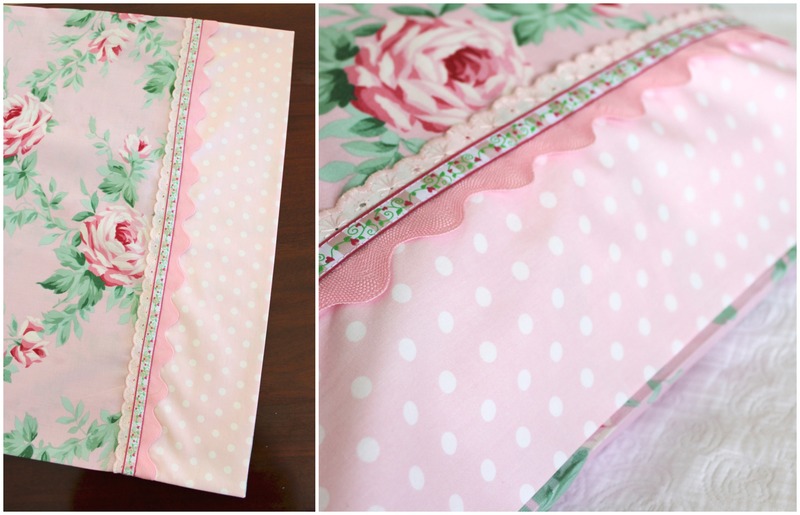 I’ve written this tutorial for a pillowcase based on the standard USA size of 20” x 26”. However the tutorial is easily adjustable to fit other sized pillows or cushions. 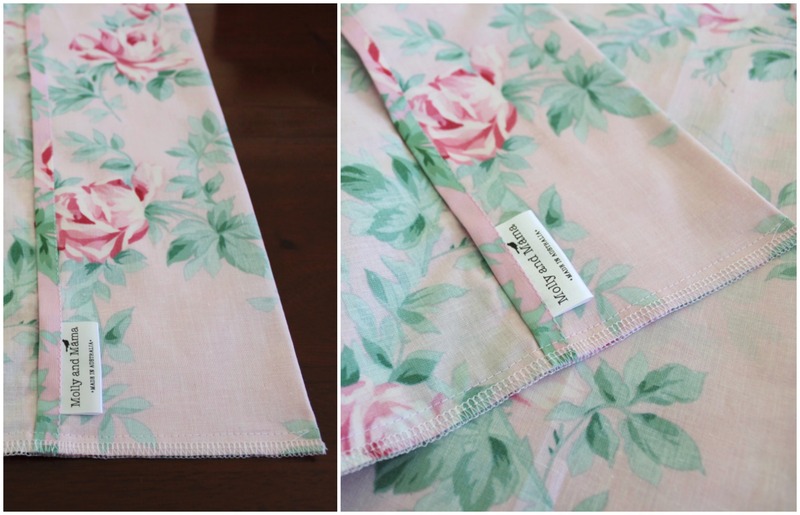 Pillowcase cuff (from coordinating fabric) – 21 inches of fabric length x 9 inches of fabric width. – 21 inches of trims like lace, ric rac, and braids that work well together. First we’ll attach the lace and cuff to the width of the pillowcase top. 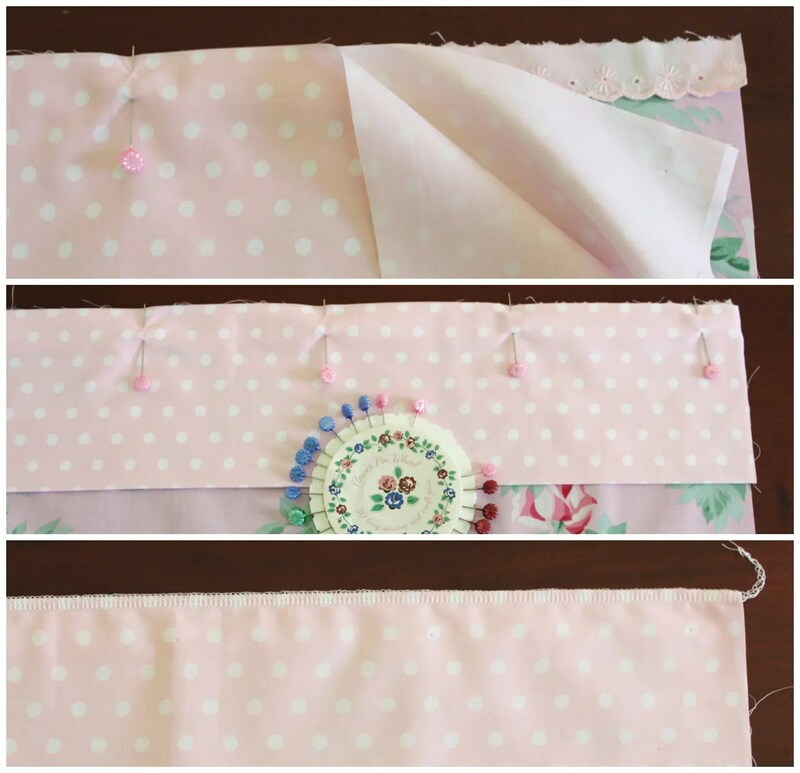 Take your cuff piece of fabric and fold it in half lengthways with wrong sides together. Give it a good press. Lay your piece of lace right side up, on the right side (width) of the pillowcase top. Take your cuff and lay it carefully over the lace so that the fold faces the base of your fabric. Pin all four layers together (base fabric, lace, and two cuff layers). Stitch the layers together. I used my four-thread overlocker (serger), which creates a straight seam stitch, as well as finishing the edges at the same time. You can also stitch the layers together on your sewing machine first. Then finish the seam with your overlocker (serger) or with a zig zag stitch afterwards. Be sure to use a smaller seam allowance, no more than 3/8”. And be sure not to stitch over your pins, but remove them as you go. 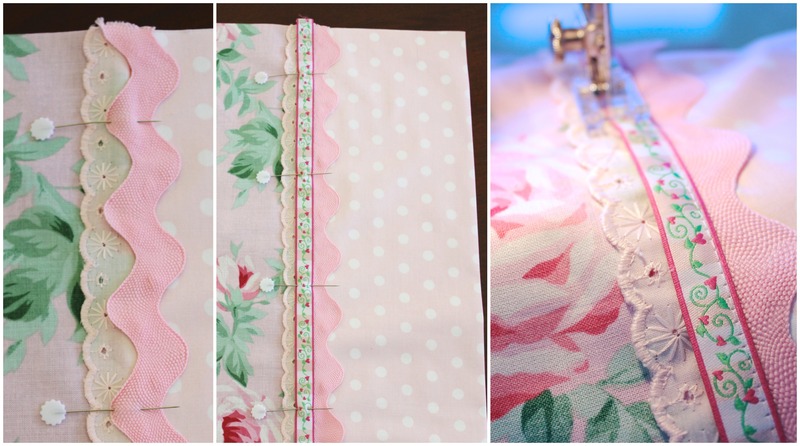 Press your seam towards the body of the pillowcase so that it rests under the lace (be very careful with your iron heat settings if your lace or trims are polyester based). Flip it over and gently press the lace down flat (use a press cloth if necessary). 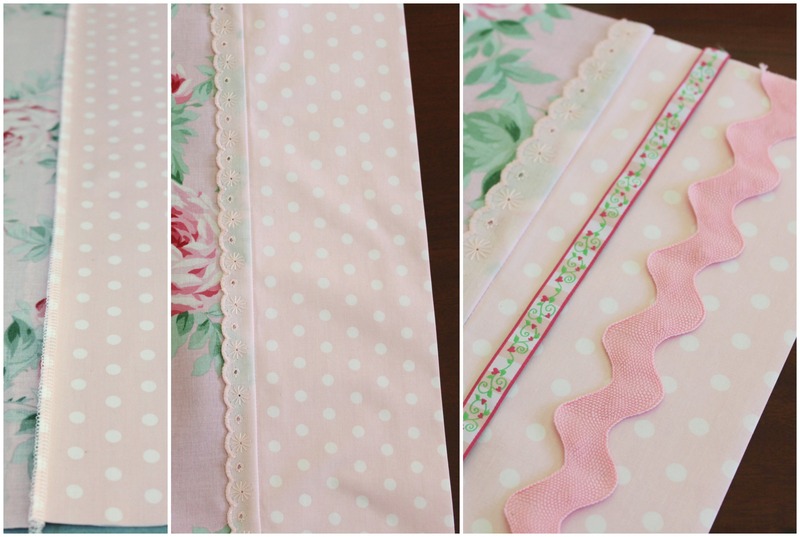 Lay out your trims to decide the best way to pin and stitch them. I pinned my ric rac over the seam line first. Then I pinned my braid in place. Using complementary threads, stitch down your braid with the sewing machine. Use a stitch length suitable for the project. If it’s too small, it may create puckering through your layers. I stitched the right side first, then the left. I used my clear sewing machine foot (sometimes called an appliqué foot), so that it was easier to see what I was doing. And I used the foot edge as a stitching guide for straighter seams. When you’ve finished, your pillowcase top should look like this. First we’ll need to hem one edge of the fabric width. This will form part of the fold that we tuck our pillow into. 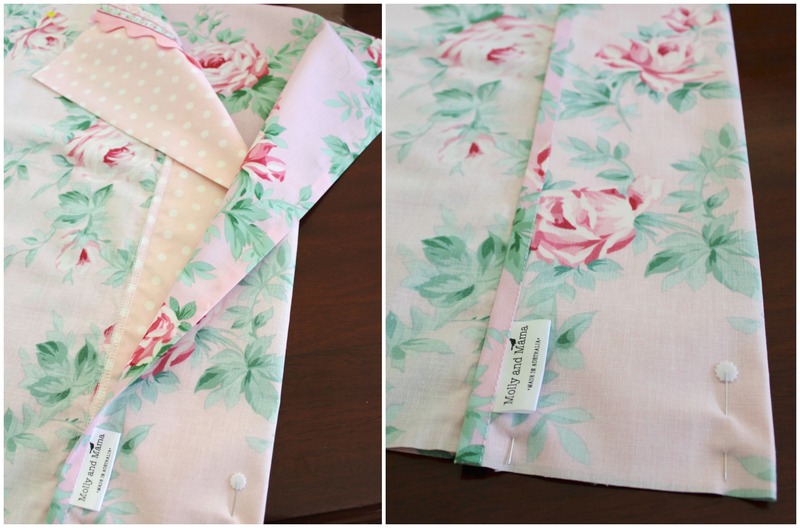 Take your pillowcase back piece and press over a 3/8” fold on one side of the width of the fabric. Fold it over the same again and press flat. Pin the hem down for easier stitching and use a straight stitch on your machine to hem the fabric. Be sure your threads (especially your bobbin) are coordinating colours! At this stage, I like to sew a care tag in the seam. Give everything a quick press and we’re ready to put it all together. Lay your pillowcase base ‘face up’ on a flat surface. Lay your pillowcase top ‘face down’ over the base piece (so right sides are facing together). Be sure to match up the left hand edges. The right side will have an overhang. Pin the top, bottom and left hand edges together neatly. On the right hand side (or opening of your pillowcase), the base piece will have a large overhang (about 12cm or 5”). Take that piece and fold it over the edge of the pillowcase top, so that you are covering the cuff. Pin the sides of the overhang down (by replacing any pins you’ve used to pin the pieces together underneath). At this point, make sure that your folded fabric sits exactly over your decorative cuff underneath and that there is no gap. 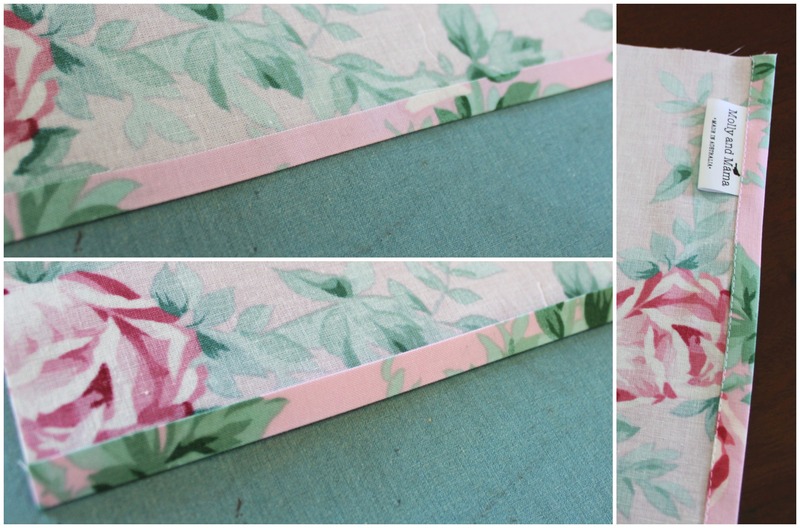 Using your sewing machine, stitch together the seams on three sides. Start at the top right of your pillowcase (we’re stitching the fold down here too). Continue down this seam, pivot about 3/8” from the base, stitch again, pivot again at the next corner, and then stitch up until you reach the other end of the fold. I used a smaller stitch length at this point and a 3/8” seam allowance. Overlock (or serge) your edges, to give a neat finish. Here’s a close up image. We’re almost there. Fold back the overhang and flip the pillowcase right way out. Give your seams a gentle press. Check your iron temperature and don’t forget to be careful of your trims! Pop in your favourite pillow and you’re ready to go! How simple was that? And how pretty does it look? – The direction of the pattern or print on your fabric. You don’t want your pillowcase fabric to be upside down when it’s displayed on the bed. So be sure if it’s a directional pattern, to cut it and sew it right way up. – Where the bed is positioned in the bedroom will affect where you would like the pillowcase’s decorative edge to be. My daughter’s bed is against a left wall, so I want the decorative edge to be on the right hand side of the pillowcase. – Laces, braids and ric racs may all have a polyester content so be very careful when ironing your trims down. Use a press cloth (or scrap of quilter’s weight cotton) if necessary. – Add other adornments like applique to really give your project a personal feel. You can learn how to applique HERE, and you can see all the available Molly and Mama PDF applique templates HERE. And if you’ve gotten this far, thanks for staying with me! I hope you’ve gotten something useful from the tutorial. I have another pillowcase tutorial which you may also enjoy HERE. My Girl’s Bedroom Pinterest Board has some pretty inspiration and ideas. Pop over for a look. 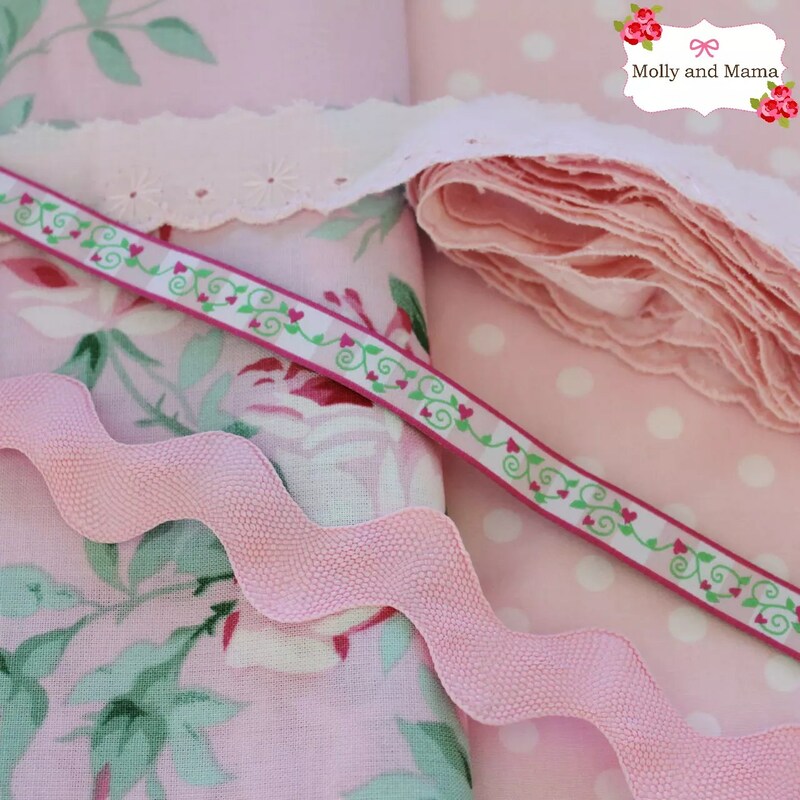 And feel free to share your work on the Molly and Mama facebook page! Thank you Julieanne. Drag out the sewing machine. You’ll enjoy it! Great tutorial. Attempting a few lap quilts for Christmas. This would be a great add on. What a great idea Carly! Thanks for your feedback. Can I ask where you got your Personalized Tags made? I absolutely love that idea!!! Hi Joey, I purchased the sew in tags used in this project from the store ‘Ikaprint’ on Etsy. I also use World Wide Label for sew on labels. I hope that helps! Happy stitching! Could you tell me what measurement for a queen pillow 20×30. 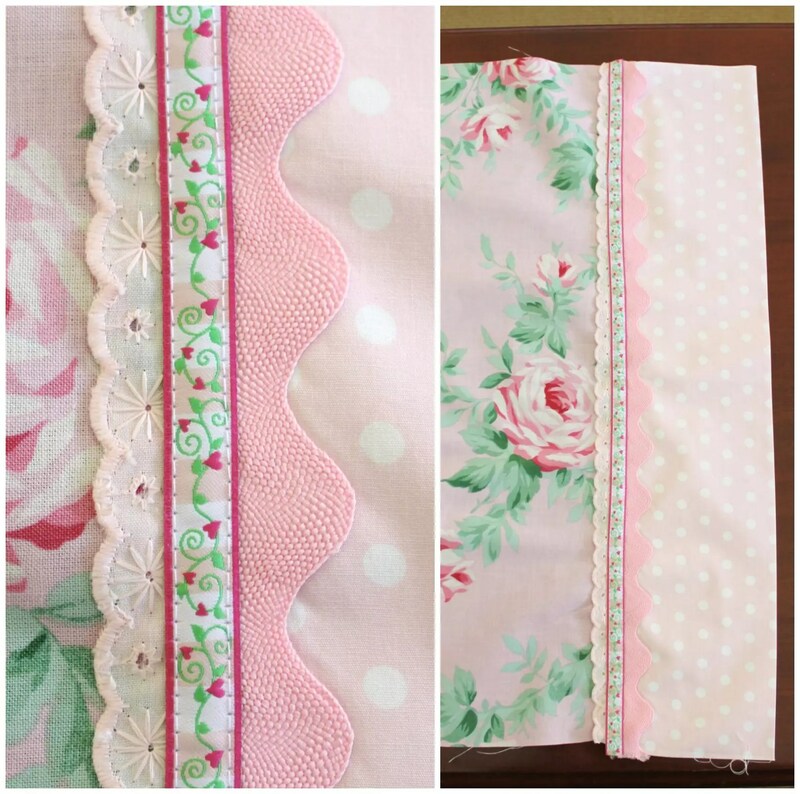 Hi Judy-Ann, are you after fabric measurements to sew a pillowcase? Is this for a pillow that measures 20cm x 30 cm or 20 inches by 30 inches? Feel free to send me an email at hello (at) MollyandMama.com.au so I can help you out. Many thanks.